The outpost northwest of West Ardougne has served for generations as the home of many events. But now it's about to be demolished! Help Jorral preserve history by saving the outpost before it's too late! 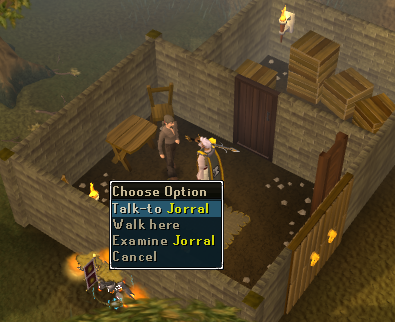 Talk to Jorral who can be found to the northwest of Ardougne in a small building. To start this quest, you have to speak with Jorral, who is in a building northwest of Ardougne. The most practical way of getting to Jorral is to teleport to the Ardougne lodestone and head west. When you find Jorral, speak with him and he will immediately be panicking about something. Apparently the building has a great history and is about to be demolished by King Lathas to make a new alchemists' lab. Jorral will admit to not knowing the history of the building himself, but asks you to uncover it for him to try and persuade King Lathas not to destroy it. You will go into a brief cutscene, when it is over, tell him you will help. Jorral sends you off to investigate and tells you about 3 people that may be able to help. You can talk to them in any order: Erin of Ardougne, Droalak of Port Phasmatys, and Blanin of Rellekka. 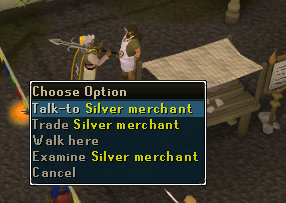 Teleport back to the Ardougne lodestone and head southeast to the silver merchant, Erin. Ask him about the outpost. Erin's great grandfather lived and died in the outpost, but Erin knows very little about him. He will give you a key, as he does not know what it is for. 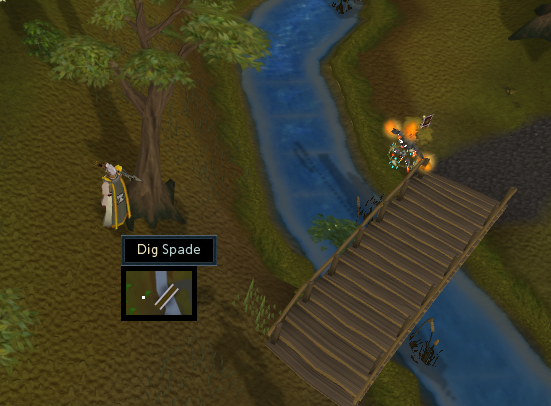 Now head to Castle Wars and don't forget to bring your spade! Using a ring of duelling will speed this up significantly. Go north across two bridges. Stand on the west side of northern bridge and walk 4 steps north. Feel the key, it should be steaming. Use your spade to dig and you will get a chest. Use the key on the chest to get a journal. 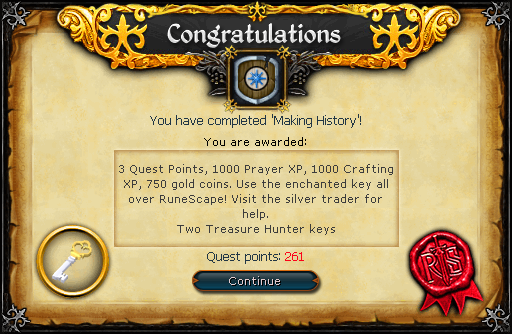 Before continuing, make sure you have equipped your ghostspeak amulet and have a strung sapphire amulet with you. If you have completed Ghost's Ahoy and have an Ectophial, use it to teleport to Port Phasmatys. If not, make your way there using some other method. Another disadvantage of not having completed Ghost's Ahoy is that the ghost guards will make you pay 2 ecto-tokens to get in Port Phasmatys. Just worship the Ectofuntus one time (requires a pot, a bucket, and any kind of bones) for 5 ecto-tokens (collect them from the ghost disciple nearby). Then enter Port Phasmatys. Head south a little and find the General Store - you can find Droalak wandering around outside. Speak with him (while wearing the ghostspeak amulet). He will tell you he died at the outpost. He does have something that can help, a scroll, but he requests your assistance first. His wife was never able to forgive him for never returning home after she asked him not to go to the outpost, so you have to patch things up. His wife, Melina, is one building east of the general store. Give her the amulet and she will forgive him. Now talk to Droalak again and he will give you the scroll. Blanin, Dron's brother, can be found in Rellekka. Using an enchanted lyre is the fastest way of getting there, or you can use the Fremennik lodestone. 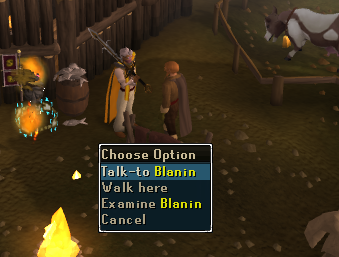 Blanin can be found near the chicken pen in the southeast part of Rellekka. Talk to him and he will warn you that you need to know a few things before talking to his brother. 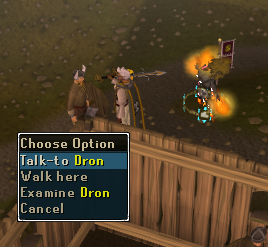 Once he is finished, head over to Dron north of the helmet shop, which is slightly north of Blanin. When he is done questioning you he will allow you to ask him questions. He will tell you what he knows about the outpost. Return back to Jorral with the journal and the scroll. Give him everything and he will be very pleased. 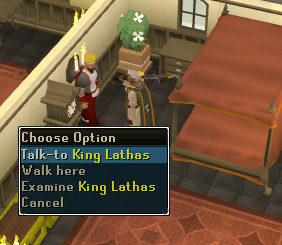 He will give you a letter that he wants you to deliver to King Lathas. Teleport back to Ardougne and hand the letter to the King on the second floor of the castle on the west side of the Ardougne river. The King will accept Jorral's request and write you a letter to take back to Jorral. Run back over to Jorral and give him the letter from the King. He will be very relieved, and will promptly turn the outpost into a museum. [^] Talk to Erin, the silver merchant about the outpost. [^] Use the enchanted key to dig up a chest with a journal in it near Castle Wars. [^] Talk to Droalak and help him patch things up with his wife. [^] Talk to Blanin about his brother. [^] Talk to Dron and answer all his questions correctly to get information from him. [^] Talk to Jorral and show him everything. [^] Take Jorral's letter to the King. [^] Take the King's letter to Jorral. Note: For a more in-depth guide for these chests (with maps and more specific info), please see our Enchanted Key I Mini-Quest guide. The locations are not exact, as for each chest is a small area (rather than a single square) that you can dig to find the chest. Go southeast of the Fremennik lodestone and west of the Golden Apple Tree. Go southwest of the body altar in Edgeville. It is around the path that leads to the body altar, south of the boulders. Go west of the Exam Centre and slightly northeast of the musician. Go south of Falador's south wall by the chainmail shop. Head northeast of the clan citadel portal and just west of tent and east of the bank chest. Go east of the water altar in Lumbridge Swamp and south of the Lumbridge crater. Go to the ponds just north of Al Kharid and west of the Duel Arena. Stand so you have one pond north of you and the other one west of you. It is around here. Go south of Ardougne Zoo to where Brother Cedric and his broken cart is found and dig around there. Go to the middle of the Grand Exchange, right next to the fountain. East of Yaktwee, northwest of Jorral (the starting point for Making History). The treasure is just south of the benches. Go northeast of where Thurgo lives in Mudskipper Point south of Port Sarim, and the chest is just southeast of Endwyr, the Emissary of Seren, by the willow trees. 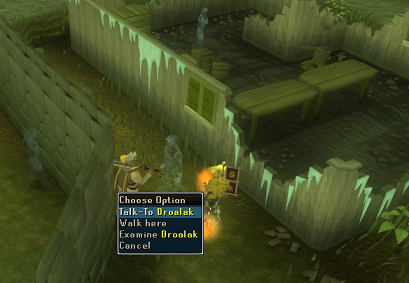 Walk west of the spirit tree in the Gnome Stronghold so the spirit tree is on the edge of your mini-map. It is around here. Once you have found all of the chests, the key will dissolve in your hands. The order is random for each player, but the rewards are the same for each location. 29 Rune Essence, 20 Mind Runes, 15 Law Runes?